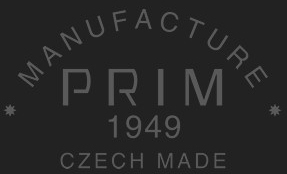 Prim, the Czech watch company, was founded in 1949 in the north-east of Prague, in the small town of Nove Mesto nad Metuji. The production of various time measuring instruments in the Czech Republic has a long tradition. The clear evidence of this fact is the Astronomical clock on Old Town Hall, constructed in 1410. The mass production of time measuring instruments in the Czech Republic was launched at the close of the XIX century. In 1889, in Broumov (eastern Bohemia), the branch of Gustav Becker company was opened, it specialized in the production of interior clocks. Gustav Becker was one of the most talented watchmakers of that time. He was born in 1819 in Lower Silesia. In 1837, he graduated from the watchmakig school, and in 1847, he opened his own manufactory in the city of Freiburg. In 1852, his bracket clock was awarded the gold medal for its "original design" at the industrial exhibition, held in Silesia. Becker's masterpieces received various awards for their "high quality, perfect work and original design." In 1890, in the Czech Republic, the watch factory was registered in the commercial register as an independent company. In 1930, the shares of the company were bought by the German Junghans watch company, and in 1948, it became the part of the national enterprise Chronotechna, founded in Liberec. At the present time, the Czech watch industry is based on the traditions of German watchmaking. In 1949, a branch of the national enterprise Chronotechna was opened in the town of Nove Mesto nad Metuji, it was engaged in the popularization of the Czech products. In 1969, the branch acquired the status of an independent enterprise and was renamed Elton. After the breakup of Chronotechna company, the Czech watchmaking industry was greatly invested. Since 1969, Elton hodinářská a.s. has been developing the production of Prim watches. From 1970 till 1980's, 500 000 wrist watches were issued. In 1989, the company gave up the mass production of watches, and in 1990, it appeared on the verge of bankruptcy. The company's management has revised the marketing strategy. Today, the main feature of Prim philisophy is the development of luxury watches: the brand produces watches, belonging to the high price bracket. Prim watches are assembled on the basis of the in-house movements (mechanical Calibre 94, 94.01, 98, 73, 96.01, 77.51, 98.01, 96, 80,66, 50, there are also quartz movements – Calibre 37, 38, 39). We known, that in the past, many companies released the watches, based on the in-house movements. Today only a few well-known companies develop and create their own watch elements. Prim company cooperates with the leading Czech designers, who do not cease to amaze the fans of watchmaking with their innovation developements. The classical watches also remain on the spotlight of the designers, because the models, created according to the fashion, can quickly lose their relevance, but the classical style with clean lines and minimalist design will never go out of fashion and will not lose its charm. The company released the following collections of watches: Diplomat, Pavouk, Spartak, Linea, Elegant, Sport, Arteu, Specials. Today the main focus of company's activity is the development of custom-made watches. While working with a client, the principle of free choice and the individuality of the person comes to the forefront. While creating the watches, the company primarily uses its own movements, however, the watch can be optionally based on the Swiss, Japanese or German movements. The cases are made of traditional materials – stainless steel, gold, platinum, but the specialists also use such rare material, as Damascus steel. Damascus steel is not widely used in the watch industry because of numerous difficulties, appearing in the process of watch production. The watches of Damascus steel are created by the technologically advanced companies. The patterned metal with rich decorative features has been used in the knives production for many years. Today, Damascus steel is more likely to be used by designers. Different graphic symbols and lines, that appear on the Damascus steel, give each product a unique decorative personality. In 2011, the company opened its salon in the Pánská pasáž in the center of Prague. This is the first shop, offering Prim watches. The connoisseurs of the Czech quality can find the classical and modern watches in this salon.